Learn Italian and enjoy the artistic and cultural treasures in the city where the language was born. Combine your Italian classes with business, placements, culture, cooking, wine tasting or art courses. The school is situated in the center of the city with a beautiful and unique view of the famous Ponte Vecchio. 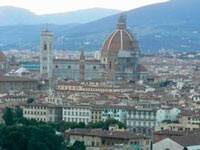 During summer, the school offers another location to study, 3 hours from Florence. On the beautiful island of Elba you can combine learning Italian with a holiday to the island. Florence is one of the most famous cities in the world and is where the Italian language was born in 1300. Around every corner of the Tuscan city you’ll find artistic and cultural treasures that will make your experience enriching and unforgettable. This is the perfect place to combine learning with a holiday. After classes, numerous activities are organised for you to see the amazing museums, cinemas, concerts, festivals, theatres, sports and nightlife. Submerge yourself in the magic atmosphere of the city whilst you learn Italian with charm. 20 lessons of general Italian a week, 50 minutes long from Monday to Friday. Large social activity programme is offered with museums, cinemas, concerts, festivals, theatres, sports and nightlife. Starts every Monday of the month except Christmas. 24 or 30 lessons of Italian a week. Starts every Monday of the month except Christmas. 1 week minimum duration. These classes are very flexible; you have the possibility to have lessons on Saturdays too. Starts every Monday of the month except Christmas. 1 week minimum duration. 20 lessons of general Italian + 10 lessons of Italian and business a week. The classes are focused on economical, commercial and business aspects of the world. Starts every Monday of the month except Christmas. 2 – 4 weeks long. Minimum level is intermediate. 20 lessons in general Italian + 4 lessons of cultural Italian a week. This programme offers you the opportunity to combine learning the Italian language with its culture. You’ll learn about social and cultural aspects of Italy such as the history of the country, the different dialects, the regional folklore, traditions, cinema, music and cooking. Minimum level is intermediate. 2 weeks long. Starts every Monday of the month except Christmas. 20 lessons of general Italian + 1 lesson of Italian cooking or wine tasting a week (around 4 hours). Italy is famous for its great cuisine. The lessons will take place in a local cooking school with an expert chef where students will learn the secrets of cooking traditional Italian food. Additionally, you will learn cooking times; presentation of a dish, the story of traditional recipes and at the end student can eat their prepared dish with a glass of great Italian wine. You will learn the technique of wine tasting of the different Italian regions. 1 week minimum duration. Starts every Monday of the month except Christmas. 4 weeks of general Italian courses + 4-16 week placement in a business in the hotel, tourist, marketing, administration, fashion, import/export, architecture or art sector. Must enrol 2 months minimum before the programme starts. Minimum level is intermediate. Starts every Monday of the month except Christmas. 20 lessons of general Italian from Monday to Friday + 12 lessons of art (4 classes, 3 times a week). Combines learning the Italian language whilst enriching your painting, architecture and sculpturing skills. Florence is one of the most important art capitals of the world, home to Renaissance art. The course is 2 weeks long. Italian and Art: 30 lessons in spring or summer of general Italian with an art programme which includes Renaissance art, visits to museums (Palazzo Vecchio, Duomo, Uffizzi). Start dates are March 14th and September 12th. Italian and Cooking + Wine tasting: 30 lessons in spring or summer of general Italian with a cooking and wine tasting programme in a professional cooking school. Half day and full day trips to famous markets, Chianti region and eating in a local Trattoria. Start dates are April 11th and October 24th. Italian and a holiday to Elba island: It is possible to combine our Italian course for ages 40+ in Florence with a holiday at the school on the beautiful island of Elba. 30 lessons of general Italian + history of the island and the exile of Napoleon, wine tasting and day trips. 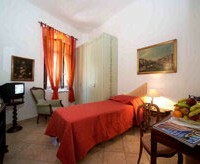 Host families with single or double rooms, half board (breakfast and dinner). Short walking distance from the school or 10-15 minutes by bus. Studios for one or two people with a kitchen, bathroom and lounge. Telephone and Internet access, air conditioner, TV available. Towels and sheets provided. Cleaning service twice a week. They are located in the center of the historic city 5 minutes walk from the school. Shared houses with single or double rooms. The bathroom, lounge and kitchen are shared. You will be a maximum of 15 minutes by bus away from the school. Light and water bill are not includes (approximately €20 a week). Contact us for a personalised quotation. Advice especially when choosing your course, preparing to leave for your course, managing your flights, security and assistance throughout your stay. Informational material, textbook and an exam on your first day to determine your level. 11 fully equipped classrooms with IT rooms, Wifi and audio-visual material. 12 students maximum per class. Final accredited diploma. All courses include 2 free lessons a week with your teacher to improve the aspects of Italian that you want to focus on, which may not have been covered in the general Italian lesson. Daily programme of activities and weekend trips (some included in the price, others are at an additional cost).